Why is Slide UX a top UX agency? It’s all about the team. Our Meet a Slider series starts with a conversation with Megan Baker. Megan graduated from Texas A&M University with a teaching degree. She was teaching elementary school during the firm's infancy, and got her foot in the door by helping Erin and Brant over summer break. Since committing to UX full-time, Megan has become the team's go-to for generative research and usability testing. When she’s not in the field conducting user experience research, she is solving usability pain points with interaction design. We asked her to share her thoughts about the user experience field and what it’s like to work at Slide UX. Like many in the field, you have an unconventional path to discovering your calling as a UX consultant. What advice do you have for people like you, who are interested in the field, but didn’t focus on it in their formal education? Prepare yourself mentally for the work you have cut out for you, but don’t give up. Be a sponge. Listen to and watch those who have more experience than you. Read books and articles, watch webinars, and attend meetups to learn from professionals in the industry. Ask for constructive criticism and take it like a champ. Learn from your mistakes. 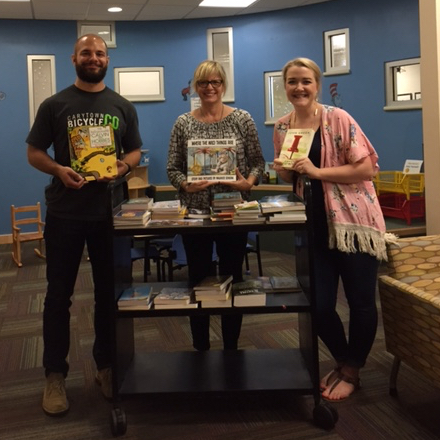 Megan and Adam donating books to Dell Children's Hospital during the Slide UX Goodwill Game. What does your typical day look like as a user experience researcher at Slide UX? I don’t have a typical day, and that’s what’s neat about this job. We work with clients in different industries, ranging from startups to global brands, so it truly depends on what projects I’m on at the time. We've outlined internal processes for user research and user experience design activities, but they are pretty flexible, which allows us to meet the demands of any project. And because we work with so many different clients, we have the opportunity to learn about different things. What is the most challenging part of working at a UX design firm? When the project plan ends! I’m not a parent yet, but I equivalate it to a child growing up and going off to college. The same as how a parent hopes they’ve sufficiently prepared their child to go out into the world, I hope that the work we’ve done for our clients doesn’t just stop at the end of the project schedule. This is especially so when there is research involved because there is so much empathy gained for the client’s users and I want so much for that empathy to disperse throughout the company. I know I can speak for my team when I say that we absolutely love to see our research impact a product or our designs go live. And I feel like we do a good job of giving our clients all the things they may need to see things through. What's the hardest part of working in the technology sector? Staying ahead of the game. Books about technology can be out of date before they even get published. In this industry, you can’t afford to get stale or you’ll get left behind. There are tons of UX resources available! Nielsen Norman Group, Smashing Magazine, and UX Magazine are some of my go-to sites with articles packed with useful tips. Sometimes you have to look for them. For example, vendors like InVision and usertesting.com have very informative email digests. I’ve found a lot of great articles and webinars from these emails; they’re great learning assets. I get most of my book references from those articles as well. The user experience team at Slide keeps a shared company Kindle library, so I’m usually reading a book in there at any given time. Austin has a thriving meetup scene as well. I’ve attended UX Book Club meetings as well as a few UX Research Happy Hours (Editor’s tip: search Facebook events to find happy hour’s near you). Adam, one of my team members, recently started sending out a weekly email with a rollup of upcoming UX & product events in Austin. Megan at a Round Rock Express game with the Slide team in the summer of 2015. What do you believe makes Slide UX different from other UX design agencies? We are thoughtful, all the way down to the fine details. Our designs are clean and well thought-through, and our research is thorough. We maintain excellent relationships with our client partners, many of whom consider us their go-to UX firm. What do you believe is the most powerful part of the Slide UX design process? Peer reviews. We usually brainstorm together at the beginning of a project, which allows us to utilize the experience and brainpower of our team, but then we implement independently. When you’re really close to something, it can be hard to see the flaws, so that’s where our peer reviews can help. Our process includes two types of peer review: internal reviews and blind reviews. Internal reviews, when senior team members review work, whether scheduled or done asynchronously, can be beneficial to uncovering things that have been overlooked or just to identify a different approach. We also do blind reviews, where a team member who isn’t assigned to the project reviews the work. The raw feedback from a mostly objective person can be extremely insightful. It’s almost like a usability test before actual usability tests. Cat or Dog? Cat...I’d like to clarify that. My cat. BBQ: sauce or no sauce? Sweet Baby Ray’s all the way! Hot Dog Toppings? Mayo, mustard, ketchup, shredded cheese, pickle relish, and Wolf Brand chili. How do you like your coffee? When I make it myself, I just put a dash of cream. But if I get it while I’m out, I usually get a hazelnut latte or cafe au lait. The 3 Way Mocha is for special occasions only.